Combine wetlands and elegance for a remarkable look in your home or garden with this Ancient Graffiti Filigree Dragonfly Raised Wall Disc. A familiar, raised dragonfly figure rests in the center of this metal disc, while a wealth of cutouts on it adds a delicate hint. The narrow body, extended antennae, and four spread wings keep the dragonfly recognizable from quite a distance, while the flamed copper colored finish showcases several brown hues. The disc curves gently inward while the dragonfly arches slightly outward for added contrast, and the metal construction forms a lasting unit. Use the keyhole opening on the back of this piece to place it on a wall in moments. The 12" diameter size looks great against an open space on your wall, and the metal construction brings a bit of shine to the setting. 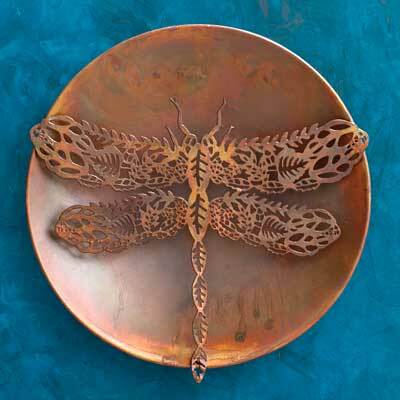 Celebrate delicate dragonflies in your home or on your deck wall with this Filigree Dragonfly Raised Wall Disc.